Indonesian Ministry of Energy & Mineral Resources to auction 43 oil and gas blocks in 2018. 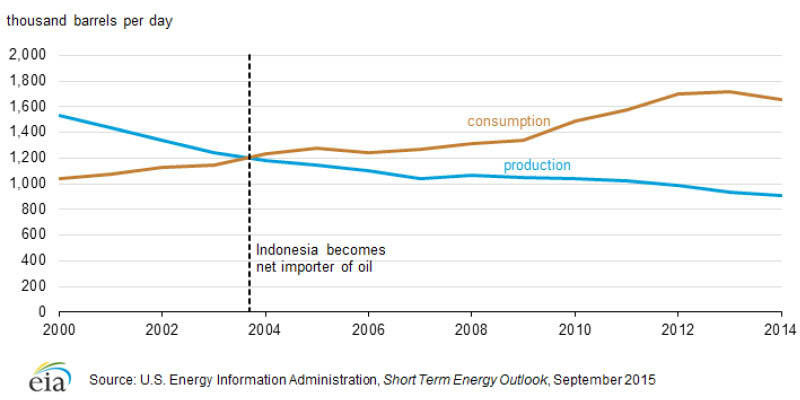 Petroleum and other liquids supply and consumption in Indonesia, 2000–2014. Image source: U.S. Energy Information Administration, Short Term Energy Outlook, September 2015. Indonesia, South East Asia’s biggest economy, was once a member of the exclusive oil producers club OPEC but in 2010, with its oil and gas industry stagnating, it left the organisation. Twenty years ago the country was producing about 1.5 MMbopd, but that has dropped steadily to its present average of about 800 Mbopd, valued at just 3% of Indonesia’s gross domestic product. According to Bloomberg, a decade ago the oil and gas sector accounted for a quarter of Indonesia’s state revenue. At the same time, internal demand has been growing rapidly, and Indonesia is now a net importer of oil and will probably become a net importer of gas early in the next decade. In an attempt to reverse this trend, in May 2017, the Indonesian Ministry of Energy and Mineral Resources offered ten conventional and five unconventional oil and gas blocks, or ‘Working Areas’ as it terms them, to potential bidders under revised production sharing rules. Despite extending the deadline to the end of December 2017, these appear to have received limited interest, with five eventually being awarded. Five of the working areas did not attract any interest at all from bidders. The ministry will auction 43 Working Areas in 2018, which will include new blocks as well as 32 which did not receive bids in the 2015–2017 auctions. Three of the Working Areas offer unconventional resources. The areas will be offered under the new PSC gross split scheme, which requires investors to pay exploration and production costs instead of relying on the government’s reimbursement as under the former cost recovery scheme. Further details of the auction will be announced in March. Whether this will help halt the decline remains to be seen, since the international industry seems to view Indonesia warily (see page 70). Frequent changes to contracts, lack of infrastructure and a perception that Indonesia is not an easy place to do business have not helped in the fight for scarce exploration funds in the present straitened times. A lack of drilling success has compounded this reduced interest. and 168 are under exploration. What effect will the new modernising president have on the oil and gas industry in Indonesia? Harry Matchette-Downes describes a trek to the summit of the volcano Rinjani, on Lombok, Indonesia, and down to the shores of its crater lake. One of the last intact wildernesses left on earth, Papua New Guinea is experiencing an unprecedented resurgence of interest from the hydrocarbon industry. Is it possible to encourage the advances of modernisation and the oil industry without jeopardising the ecology and culture of this amazing country? With the announcement of the 2011 Syrian International Offshore Bid Round, interested oil and gas exploration companies have an exciting opportunity to assess the hydrocarbon potential of this highly prospective region.